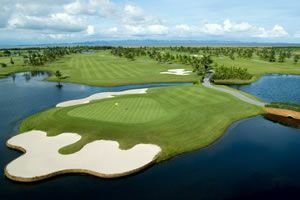 The Siam Country Club Plantation Course is simply an amazing golf course. 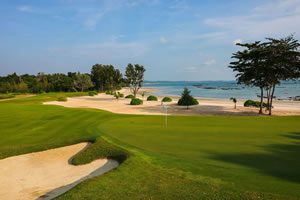 Home to the 2009 US LGPA and the 2015 Thailand Open, the Pattaya course plays as difficult as any golf course in Thailand. Nothing was spared by designers Lee Schmidt and Brian Curley. The Sugar Cane Course is the Siam Country Club&apos;s third nine which plays out to the left of the driving range and staging area. The par-36, 3,736-yard layout is arguably the best of the 3 nines and includes the spectacular fifth. 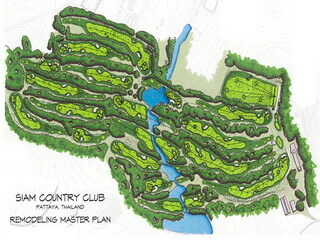 A par-5 with over 28 bunkers the Plantation Course’s signature hole plays long uphill with a split fairway. While inviting, the right side fairway is in play, but makes for a very difficult and long carry to have any chance to reaching the green in regulation. Hit to the left fairway and to take advantage of the much simpler approach shot and have a good chance for par. Practice facilities include a grass driving range complete with pitching area, sand bunker, and large practice putting greens for golfers wishing to &apos;try-out&apos; the course prior to play. Riding carts are compulsory on this up-and-down hilly tract. However, it is important to note that carts are restricted to cart path only, except on the aforementioned two-fairway Sugar Cane fifth hole. This applies to everyone, including handicapped golfers. The magnificent contemporary designed clubhouse with excellent restaurant and lounge area overlooks both the triple green and Pattaya City makes a great place to reflect on your day and think about how you can conquer this course on your next round! Have you played golf at the Siam Country Club, Plantation Course and took some nice photos that you would like to share with other golfers? Send them to us and we may upload them here. Thank you in advance! I played this course when it was 18 months old. It is long! Only 1 occasion where I was hitting a mid iron to a green on a par 4. My friend bet me a beer I would not break 100. He almost won. Greens were quick! Its worth the money. So close to Pattaya, and what an amazing surprise. I would never have imagined that Pattaya has such nice golf courses. I can highly recommend Siam Country. We are planning another holiday with you guys and would like to golf here again. Montri gave us some excellent advise during our round!